When first published, The Sociological Tradition had a profound and positive impact on sociology, providing a rich sense of intellectual background to a relatively new discipline in America. 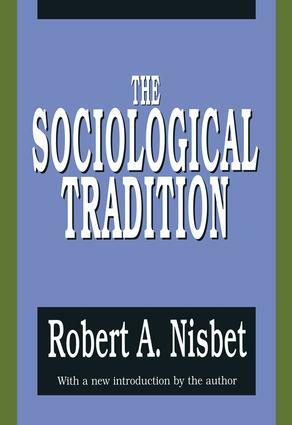 Robert Nisbet describes what he considers the golden age of sociology, 1830-1900, outlining five major themes of nineteenth-century sociologists: community, authority, status, the sacred, and alienation. Nisbet focuses on sociology's European heritage, delineating the arguments of Tocqueville, Marx, Durkheim, and Weber in new and revealing ways.When the book initially appeared, the Times Literary Supplement noted that this thoughtful and lucid guide shows more clearly than any previous book on social thought the common threads in the sociological tradition and the reasons why so many of its central concepts have stood the test of time. And Lewis Coser, writing in the New York Times Book Review, claimed that this lucidly written and elegantly argued volume should go a long way toward laying to rest the still prevalent idea that sociology is an upstart discipline, unconcerned with, and alien to, the major intellectual currents of the modern world.Its clear and comprehensive analysis of the origins of this discipline ensures The Sociological Tradition a permanent place in the literature on sociology and its origins. It will be of interest to those interested in sociological theory, the history of social thought, and the history of ideas. Indeed, as Alasdair Maclntyre observed: We are unlikely to be given a better book to explain to us the inheritance of sociology from the conservative tradition.